Well, back from a few days with my daughter at the Royal Manitoba Winter Fair in Brandon. Saw lots of horse shows...and the Super Dogs three times. How did THAT happen? Back in the shop I got the planking all finished on the new canoe, picked out the little brass shards that result from driving in some of the tacks, sanded it all nice and smooth, and got the first coat of varnish done. I also made the seat, thwarts, and gunnels. 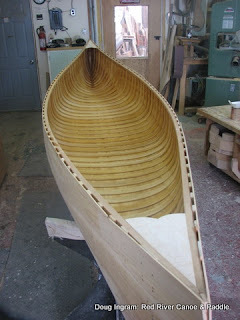 Once the canoe has a couple more coats of varnish, I can clean up the outside of the canoe and get the canvas and filler on. 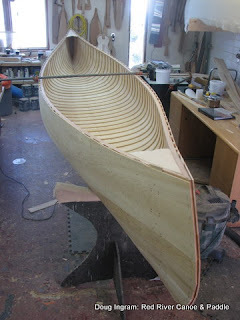 Starting to look like a canoe now! Posted by Doug Ingram at 8:01 p.m.